Dipping a toe into the real-estate market these days can feel a lot like taking your car to the mechanic: If you don’t know what you’re doing and don’t trust the professional you hired, you may feel like someone is taking advantage of you. Thankfully, the Web’s ability to demystify intimidating topics has brought what was once considered insider real-estate knowledge to the masses. This week, I tested Trulia.com, a real-estate site that’s geared toward helping people who are ready to buy. Trulia combines a simple approach to real estate that anyone can grasp, with enough market stats to excite number-crunching types. It also offers a community where regular users can ask 200,000 real-estate professionals questions without fear of being hounded by agents because their emails are hidden. An iPhone app from Trulia.com uses GPS to find nearby open houses. Trulia has been around since 2005, but started out as a site that only posted local real-estate listings in California and New York. After expanding to the national market in 2006, it added other features like pricing heat maps (color-coded to indicate prices in an area), comparable listings, an online community and automatically generated newsfeeds about specific properties and areas. 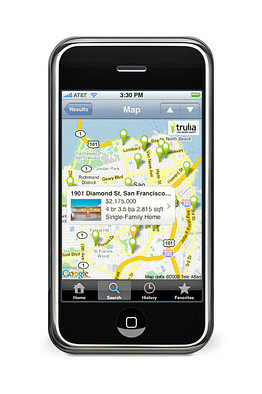 Last summer, Trulia went mobile with a free iPhone app that uses GPS to find nearby open houses. Starting Wednesday, Trulia will offer CompareIt, a tool that lets users choose five properties for sale to directly compare with one another. Before now, Trulia just generated a list of comparable properties that sold or are for sale at the bottom of a listing. I only used Trulia for a week, and I’m not a typical buyer since I was just looking — for now. But I got a lot out of the site, especially by browsing maps of neighborhoods that I know well (I’m picky about my preferred location) and asking questions of the Trulia community. Its iPhone app listed nearby open houses according to my search criteria and also worked on my iPod touch as long as I was in a Wi-Fi zone. Another big plus to Trulia is Newsfeed, a list that shows up on the home page with content that’s automatically generated and personalized according to your past search locations. It is updated every day and spits out stats like the number of price reductions, open houses and new listings in an area. It shows an area’s average listing price, median sales price, number of foreclosures and average price per square foot, among other things. These data are a boon for people who don’t have the time or inclination to look this stuff up, and it aggregates the data into one intelligible, quick snapshot. I found some flaws in Trulia, like the way it accidentally listed a property that was sold five months earlier. Trulia said it relies on partners for accurate listings, and those partners get their data from Multiple Listing Services or local brokers and agents, therefore Trulia’s data are only as good as its partners’. (At least one other real-estate site also accidentally listed the already-sold condo for sale.) Another problem occurred when I tried to use the CompareIt chart on Washington, D.C., properties; Trulia said the tool doesn’t work for D.C. due to a bug that it hopes to fix. Finally, properties saved on the iPhone app won’t transfer to your Trulia Web site account. The company says it hopes to fix the iPhone issue. 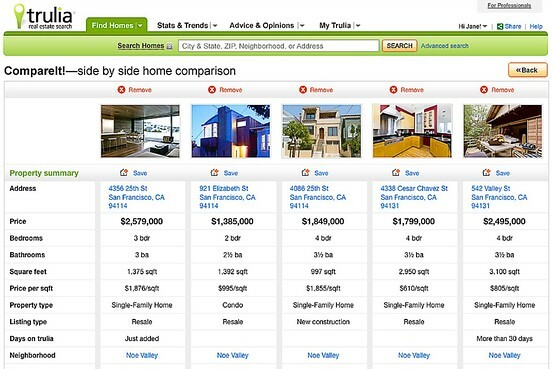 Trulia’s CompareIt lets users compare five properties with one another. One of Trulia’s competitors is Zillow.com, which displays its own price estimates for all houses in the U.S. (for sale or not) to give people an idea of the real-estate value in an area. The two sites are similar in some ways: Both show heat maps, display data about nearby schools, have mortgage calculators and use online communities to answer questions. 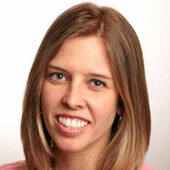 But Zillow doesn’t offer a stat-packed Newsfeed or an iPhone app like Trulia. After browsing through Trulia, I found a variety of properties that suited my target price range and location preferences. One place had lots of big windows and a renovated kitchen, according to the photos and information listed on its detailed Trulia Web page. A shortcut on the page made it easy for me to share this place with three friends to see what they thought. I even posed a question to the Trulia community about the property: Does this unit have a private entrance, or does it share an entrance with the five other units in the building? Ironically, this was the property that was already sold, as I found out when a real-estate agent responded to my question. It took him just 15 minutes (Trulia says this is within five minutes of the average response time) to post a response saying that he was familiar with the listing and that the place sold five months earlier. Trulia has since updated this property’s status. Other questions that I asked of the community were answered within 20 minutes. In one instance, I asked a general question about the best time of year to buy in Washington, D.C., and three real-estate agents responded almost immediately; two were from my area and offered their advice — and their services — but one from Florida chimed in simply to offer some encouragement. Each responder was clearly identified with a name, classification (i.e. real-estate pro) and photo. Within a couple hours, four more people responded. These questions and answers are shared with everyone on Trulia, and I clicked on a thumbs-up icon to vote for the answer I found most helpful. Email alerts can be set up through Trulia so you’re notified if a property you like dips below a certain price, or if there are new blog posts about certain categories like financing, crime or environmentally friendly properties. The CompareIt tool worked to see how properties (excluding those in D.C.) stacked up against one another, up to five at a time. These charts arm people with more statistics and (likely) more negotiating power. The real-estate world can be intimidating, now more than ever. Though sites like Trulia won’t solve this problem completely, they could make the weighty decision of buying a house a little bit easier.